Doesn't Guitar Hero look realistic these days? 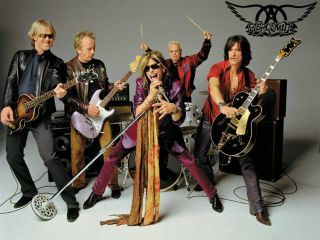 Aerosmith are all set to hit the studio later this month to start work on a new album. Given that Steven Tyler spent seven hours a day "wrapped in a rubber suit" for the creation of Guitar Hero: Aerosmith, and recently completed a stint in rehab, you might think the band deserve some time off. But, as Tyler puts it: "[it's] just your usual Aerosmith, you can't tame it, rocking out, in your face music". Tyler also took the opportunity to announce a follow-up to 2007's massive World Tour: "The tour is booked for March or April, I believe it starts, and then we eat the States although I think there are some outside gigs but not as much as last year when we did Dubai and India and wound up in Russia".